Hello my name is Lotte and I am an English Springer Spaniel. I do not like water so my favourite beaches are wide sandy beaches. 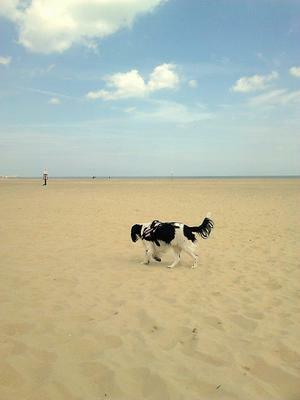 I live in the Midlands so I dont have access to beaches until I go on holiday every year with my owners. 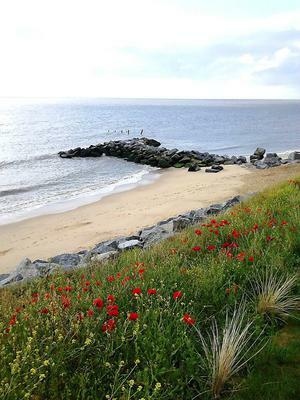 We stayed at Hopton on Sea and I did enjoy the walk here. 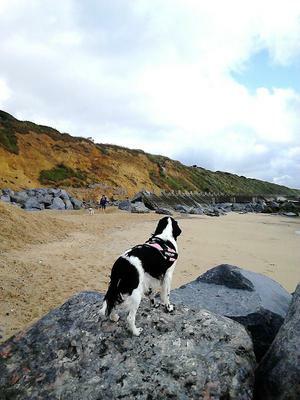 Whilst the beach is not particulary wide and the sea is close, there are lots of rocks which I enjoy climbing and being on the look out for other dogs whom I can play chase with. I will walk up to the waters edge but I do not like to get my paws wet. For sand galore I enjoy Great Yarmouth South Beach. 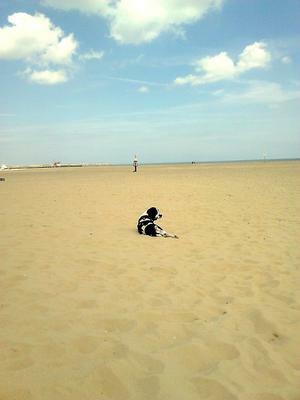 It was a glorious sunny day and I was able to run for ages in the soft sand. It is a beautiful golden colour. I enjoy digging and lying down, covering myself in it. It seems a long way to the waters edge, so a great chance to run amongst all that sand. Cant wait to come back in May this year. It's really lovely to hear from you Lottie! Also to hear from a dog on an east coast beach and to hear which beaches you enjoy. Most are from the North Norfolk Coast. Love the photos! Such a shame you don't like water, but I'm so glad you're able to enjoy the sand and rocks. The beaches here in Norfolk are indeed fantastic for running on when the tide is out. Hope you enjoy your trip back here in May!